The little mountain village of La Toussuire constitutes a part of Les Sybelles skiing area. There's something here for everyone - from beginners to more advanced skiiers. The stylish chalet is situated at 80m distance from the slope. There's a stop for the courtesy ski shuttle right outside your chalet. 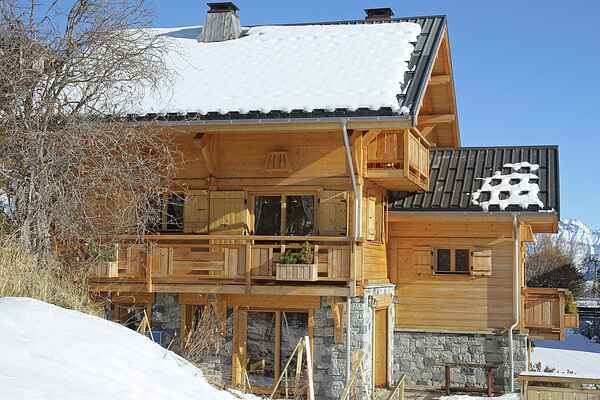 FR-73300-37 The traditional, attractive chalet (around 145 m²) has a comfortable interior and features several (south-facing) balconies with panoramic views. The chalet has three floors; the top floor is characterised by its sloping roofs. There's a relaxation area, which features a swimming pool and a sauna. The living room features a lounge and a dining area, wood-burning stove and a TV (with home cinema and DVD player). There are 5 bedrooms in total, each with their own TV. There are two bedrooms with a double bed, one with a double bed and a lofted single bed on a loft and a shower and washbasin in this room. There's one bedroom with a double bed, three single beds, a shower and washbasin, and one bedroom has two single beds. There's a bathroom with tub and a bathroom with shower (this is also suitable for disabled guests). There are 3 toilets in total. There's a laundry room with washing machine and dryer, there are 2 parking places and there's a storage room for skis which features a heated shoe rack.